The meeting, entitled: ‘Working Together to Promote Geothermal Energy Towards a Sustainable Energy Future’ – the largest such meeting of ministerial representatives to discuss geothermal energy – was marked by the release of a new report from the International Renewable Energy Agency (IRENA), coordinator of the GGA, in which access to capital for surface exploration and drilling was cited as the main barrier to geothermal development. The report also noted that more ‘transparent government regulations that avoid project delays’ were needed to provide sufficient certainty to developers and investors. Ms. Teresa Bellanova, Italy’s Vice Minister of Economy and Development, said: "Geothermal energy’s consistent and continuous availability make it a highly precious source of renewable energy both in Italy and many countries all over the world. Through our knowledge of the industry, Italy can play an important role in achieving the ambitions of the Paris Agreement, in addition to stimulating sustainable job creation." "Access to low carbon forms of energy that support economic development while mitigating climate change, is a core priority for the African Union,” said H.E. Dr. Amani Abou-Zeid, African Union Commissioner for Infrastructure and Energy. “Geothermal energy is emerging as a hidden gem of Africa’s renewable energy resources and we must work together, across nations, to ensure this resource achieves its potential. “Through partnerships and the Geothermal Risk Mitigation Facility, the African Union is currently supporting twenty-six projects in East African countries that will generate more than 1500 MW of power,” continued H.E. Abou-Zeid. “We aim to build on this, supporting sustainable exploration, through the work of this Alliance." 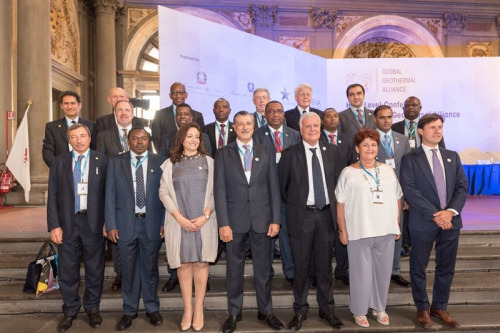 The GGA meeting was attended by more than 200 high-level public, intergovernmental, non-governmental and senior private sector representatives committed to scaling up geothermal energy deployment worldwide. The GGA membership is composed of 42 countries, and 29 partner institutions, including multilateral organisations, development partners, international and regional organisations, global financial institutions, academia, research institutions and the and private sector.